April 11, 2014 TOKYO— Sony Corp. said Friday there was a risk that batteries made by Panasonic Corp. in nearly 26,000 of Sony’s newest Vaio personal computers could overheat and catch fire, the latest product glitch for the Japanese electronics and entertainment giant. As a result, Sony is asking customers to stop using its Vaio Fit 11A laptop as soon as possible. Sony said it had received three reports of batteries overheating causing partial burns to Vaio computers. The first incident was in Japan on March 19, followed by similar incidents on March 30 in Hong Kong and April 8 in China. The company stopped selling the product at the beginning of this month. 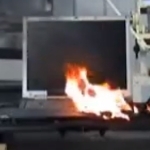 PC Safety, tips laptop battery fire. permalink.